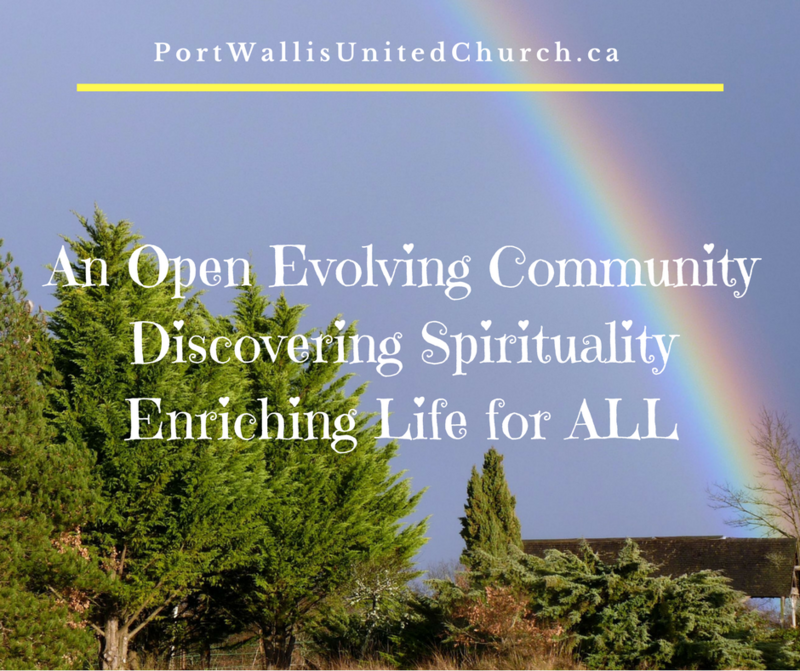 Board and Volunteer Roles at Port Wallis United Church. Do you often wonder what we do at Port Wallis on our groups and committees? Wonder no more… here is a list of our many groups and committees. Please note this is a working document being updated for final details. Official Board of Port Wallis United Church. The Board is comprised of people from various groups within Port Wallis. A Chair is elected annually at the Annual General Meeting. The board is made up of a mixture of people representing differing groups within the church: Finances, Spiritual and other Groups. The Board at Port Wallis includes: All members of the Session, All members of the Stewards committee, 1 Trustee and then 1 representative from all the other various groups and committees at Port Wallis. 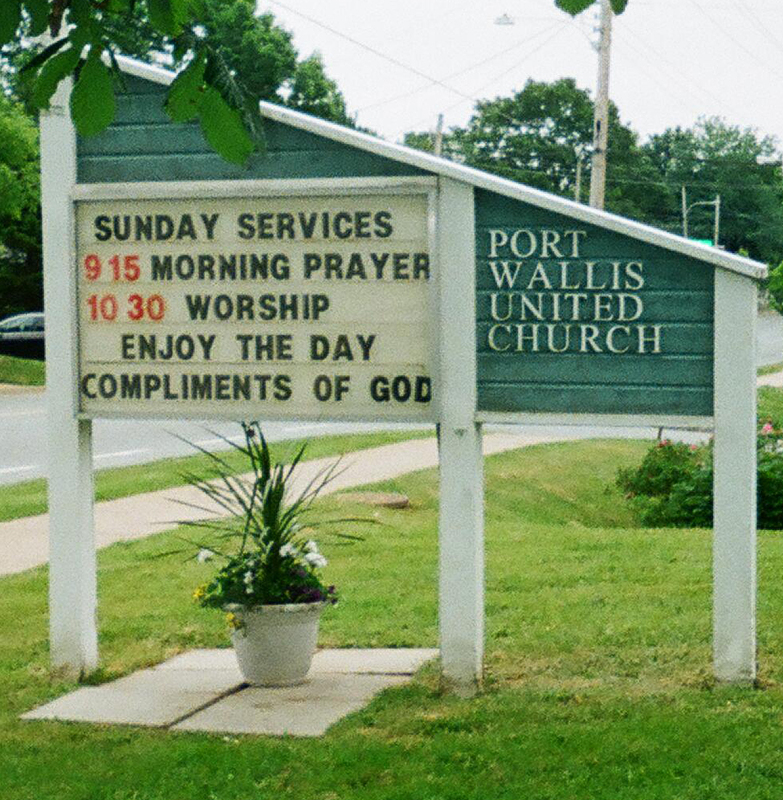 This group holds the Property of a Pastoral charge, like Port Wallis, in trust for the United Church of Canada. They are charged with keeping the buildings in good repair and proposing changes that would benefit the health and prosperity of the congregation. When you see improvements and renovations happening to our building sand [property, this group is always behind the work. Members can be on this committee for an indefinite term. One member makes up part of the Official Board . This committee looks after the financial health of our church family. Members on this committee serve a term of three years. All members on this committee are part of the Official Board. This person is responsible for maintaining our books and finances, managing the bank accounts and also reporting to the Board and arranging for various financial requirements such as preparing taxes, and all items related to the Books of our church. Envelope Secretary – Manages the affairs of the congregations donation envelopes and PAR donations. They verify the bank deposits on Sunday, attend the Stewards’ committee meetings, prepare envelope boxes for distribution the next year (Nov-Dec), end of year inputs for income tax receipts, prepare and distribute income tax receipts annually. Elders in our church tend to the Spiritual Needs of the congregation. They are responsible for the spiritual oversight and nurture of the congregation helping sustain God’s will within the pastoral charge. The group is comprised of the Minister and the elected Elders who are members of Port Wallis United Church. Elders serve a term of 5 years and all members are part of the Official Board. This group meets monthly for business and also before Communion services. This person is in charge of the Christian Education at our church which includes, Sunday School, Vacation Bible School, and Discussion groups. Sunday School Teacher – Lead Sunday school classes in their Christian education. No formal teaching experience required. We will work with you to learn what to do to deliver the content in the classes. Sunday School Treasurer – Manages the finance for the Sunday School. Vacation Bible School Volunteer – Helps out during the week of Vacation Bible school every July. IT Committee – Our Technical committee at Port Wallis who assists with our computers, hardware, software and more as needed. Pastoral Care Committee – This committee looks after the people in our church. They make home and hospital visits, phone calls and spend time chatting after church. They deliver meals to those in need and support our family in times of illness and bereavement. They meet once a month with the Minister for updates and sharing of information. Church Beautification – This groups looks after enhancing the church sanctuary with appropriate changes to our murals, decor, candles, banners and more. Changes to fit the church and yearly calendar. Ministry and Personnel Committee – This committee is responsible for the management and oversight of the church staff / employees. United Church Women’s Group – This group of women gather to support one another spiritually and as friends. They often support the church with various bake sales and other special events. Bereavement Committee – This group helps prepare items as needed for funerals at Port Wallis. They may be called upon last minute to prepare food for the reception and assist. Communication and Newsletter Committee – This group prepares our quarterly newsletter at Port Wallis, gathering articles and preparing the newsletter using Microsoft Publisher. Members also manage the website and Facebook Page updating the website with the Bulletins, announcements and other various changes and updates. They prepare and publish and manage the Church Facebook page. Affirming Ministry Committee – This group was created to lead the congregation through the affirming ministry process to be confirmed as an Affirm United Church of Canada, one that welcome people of all gender, sexual orientation, race, culture, and ability. They plan and prepare the various steps required to take Port Wallis through this 1-2 year process. Readers and Greeters – We love to have people of the congregation sign up to greet people at Sunday morning services and hand out bulletins as well as read scripture lessons at our 10:30 worship service. Weekly Bulletin and / Newsletter Folders – Many hands make light work. If you have an hour to spare during the week, we can always use your hands to help fold the bulletins and newsletter for distribution. Sunday Morning Coffee / Snacks Prep – If you would like to assist on Sunday mornings for the coffee and fellowship time, we can always use help preparing and managing the coffee/food after the Sunday Services. Feeding Others of Dartmouth – This group meets once a month, in the 1st Thursday, to prepare sandwiches for the needy at Margaret’s house in Downtown Dartmouth. Donation of bread/rolls/butter/mayonnaise/canned meat/juice/ peanut butter/jam/eggs/cheese are always welcome. Major Suppers Committee – This group plans the major supper we offer the community throughout the year: Lobster, Turkey, Blueberry and convenes the meals fro the Dinner Theatre. We have two lead committee members and then much support from others in the way or plan, prep and serving of the dinners. Small Lunch Committee – This group plans and prepares lunch or small dinners for church events such as ministerial, presbytery, congregational meetings and for certain worship services. Donations of your refundable items to Port Wallis at the Bluenose Bottle exchange at 99 Woodlawn road support these endeavours. They may ask for people to make and prepare food to assist them when needed. Prayer Shawl Committee – This group works on their own, knitting or crocheting shawls, prayer squares and pockets for adults and children, The shawls are given out for many reasons, illness, bereavement, shutins, marriage, baptism, graduation and many more… They have 15 knitters and are always looking for hands to help. You must pray as you knit as each shawl goes with a note that lets the recipient know that prayers of comfort, healing and spiritual well being have been interwoven into each shawl. 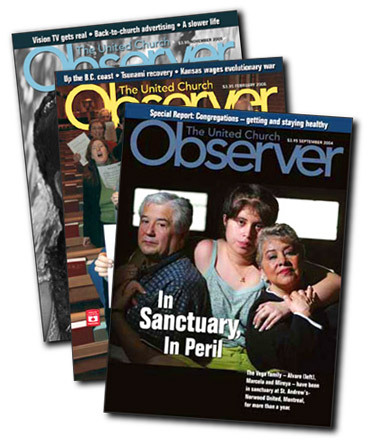 United Church Observer Rep – This person manages the subscriptions of congregation members to the United Church Observer Magazine. Junior Choir – If you are 12 and under and like to sing, join us! Senior Choir – The Senior choir sings at our 10:30 worship services, with the summers off and practices once a week under the direction of Adam Johnson, our Choir Director. All are welcome. Funeral Choir – Members of this choir are often asked last minute to perform at funeral services held at port Wallis. You do not have to be a member of our regular choirs to join this one. Musicians to shares talents at services – If you can play a musical instrument and wish to share this talent at special services or our 9:15 Sunday Worship service, please let us know! Port Wallis Players – Actors – Have a talent or interest in Acting? Let our Dinner theatre Director know and if there is space you could join this group who have hundreds of audience members laughing and smiling every year at our Dinner Theatres! Dinner Theatre Support – set/setup/teardown/serve – Dinner Theatres do not run without the production crew behind the scenes. If you have skill or interest in this area, we love to meet you. Technical Support for Lights/ Sounds/ Projectors – There is occasional need for people to help run our technical tools in the Church. as we look to use our projector in future services, we need people who can run these machines! Trades / Skills Volunteer – We often have need of small repairs and help with carpentry, construction, building and other repairs. If you have trained skills, please let us know so that when we do need help, we know where to reach out first. Bell Ringers for Sunday Morning – We are always looking for folks to ring the bell out front on Sunday mornings. Helping us let the world know Port Wallis Family is gathering together to worship. Bake Squares/ Food – You will often hear a call for this for a variety of reasons, if you want to be on our ‘Call for Baked Goods: list, please let us know. Out various committees will reach out when needed. Donate supplies – Sunday school / kitchen /office – We can always use donations of items to help keep the church running, whether for the office, kitchen or Sunday school. If you can help please let us know and we will share the need when it arises. These donations are considered non-liquid donations and tax receipts can be given fro them. Please inquire.